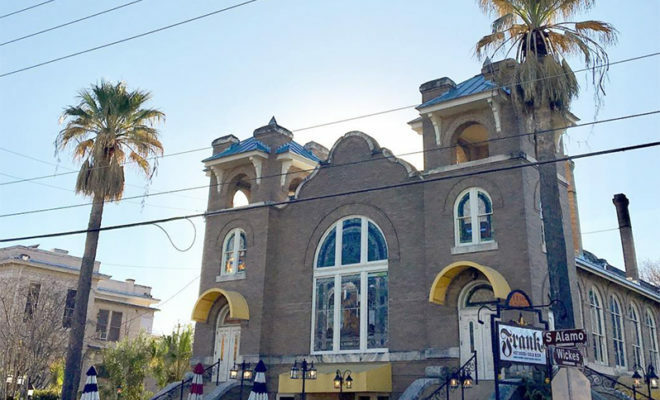 Frank’s impressive-looking location was once the Alamo Methodist Church, giving the hot dog eatery a grand feeling complete with old stained glass windows. According to Eater Austin, the restaurant’s menu was the same as the original location in downtown Austin which includes hot dogs, sausages, cocktails, waffle fries, and vegetarian options. Also like its Austin counterpart, KSAT writes Frank also functioned as a live music venue. For now, it appears the Austin Frank location (which opened in 2009) is still in good standing. Eater Austin says that the owners seem to be focusing more on their Austin ventures. “Frank is keeping itself busy. It took over the food and beverage programs at the historic Scholz Garten last year, and it opened its second Austin outpost up in Urban Outfitters’ Space 24 Twenty on the Drag last fall,” they explain. Nice back drop for a gourmet sausage and fancy cocktail…or an ol' fashioned hot dog and cold beer. Whatever. Beautiful out San Anto. Come enjoy. You have another 361 days after today to crush 2018. No rush. Three Dolla Friday at Frank. $3 Chicago Dogs, $3 Beam, $3 Hornito's. Getcho weekend started early! Hmmmmm…Half Price Frank Frito Pies today. Or wrap yourself up with a $3 Beam. C'mon Sun!